HDTV Trivia - Did You Know? Did you know that there is no green in your component video connection? since it knows about the blue and the red (Pb & Pr), it figures the rest must be green and fills it in. It’s done this way to reduce the bandwidth of the signal, making the picture elements easier to process, and reduces the connections between component devices from four to three. RGB connections typically use separate channels for horizontal (H) and Vertical synch information, where component connections contain this information in the Y channel. This is known as “synch on green”. Unfortunately for the consumer, this means that computer RGB and Component connections are not interchangeable, unless your monitor specifically supports it. Component video is further divided into two types – Y-PB-PR and Y-CB-CR, which are largely interchangeable. Y-PB-PR is an anaolog signal and Y-CB-CR is a digital signal. Most component connections support both types. Did you know that there several resolutions for Plasma displays? High definition plasmas come in several resolutions – 1024x768, 1366x768 and 1920x1080. Because they’re fixed resolution displays, meaning that the pixel count remains the same, video signals are always processed into the physical resolution of the display. Did you know that NTSC analog video has remained essentially unchanged for almost 50 years? NTSC is a set of standards governing transmission and display of video signals that has been in place since 1941. A separate colour signal was added for the “Tournament of Roses Parade”, broadcast on January 1, 1954. TV in North America will have remained unchanged for 52 years by the time we switch to DTV in 2006. Did you know that the quality of 1080 HDTV is comparable to that of 35mm film? The highest standard of HDTV, 1080i/p (1920x1080) is virtually indistinguishable from 35mm film stock, which is widely used for big budget action films and TV series alike. Viewed side by side, the two are virtually impossible to tell apart. 1080 HDTV has over two million pixels (2,073,600 pixels)! That’s almost seven times as many pixels as NTSC video! Did you know that “Contrast Ratios” are very often a misleading statistic? Most manufacturers of plasma and LCD displays advertise a Contrast Ratio, a number indicating the difference between the brightest area (Peak White) divided by the darkest area at any given moment. Contrast ratios can be enhanced by improving the black levels, the darker areas, more easily than the brighter areas. Unfortunately for the consumer, there are no standardized tests for contrast ratios. For instance, Panasonic advertises contrast ratios of 3000:1 or 4000:1 for their plasma displays. They artificially lower the black levels by a factor of 12 – anything below 12 IREs is lowered to one IRE. IREs are a unit of brightness, or luminance. 100 IREs equates to peak white, while 1 IRE equates to black . While this does extend contrast ratios, it can do so at the expense of detail in the areas being processed so heavily. Contrast can be further “improved” by testing on display panels that have had all of the optical coatings, like reflective and anti-glare filters found in the production versions, removed. Ambient light, either natural or artificial, can also affect contrast ratios. Did you know that given average viewing habits, your plasma display can last for decades? The life expectancy of you plasma is anywhere from 30,000 – 50,000 hours to half-life. That means that watching your plasma three hours a day, every day, gives you about 13,333 days, or about 37 years, to half-life! Half-life is that point in a plasma’s lifespan where the picture has degraded to 50% of its original brightness and colour. Do you know the difference between “Commercial” and “Residential” Plasma Displays? buying the “Commercial” model and a 500 watt home theater system, which will probably cost you less. Resolution from an NTSC tuner is about 250 lines (technically more, but you only see about 250 of the 425 lines available), but you will be able to access local programming easily. The FCC has two broad classifications for electronics. FCC Class A indicates an “industrial” model, while FCC Class B denotes a “residential” model. The difference lies in the shielding. The assumption is that home electronics will be in close proximity to other devices, like radios, TV tuners, etc, and so require better shielding from interference. Do you know what the plasma in your plasma display is made of? The gas inside your plasma display is made up of a mixture of three different gasses, Neon, Xenon, and Helium. The gas lights up when a current is applied to the pocket, or pixel, containing the gas mixture. These gases are inert, and harmless if released. Helium is the second most common element in the universe, and is very handy for balloons and funny voices. Xenon is present in our atmosphere, so we draw it in with every breath. Neon is a gas we’re all familiar with; no surprise it’s used in a plasma display. Manufacturers use various combinations of these gases in their plasmas. Combined with cell, or pixel, geometry, the gas mixture is the most important element in determining the brightness and colour reproduction of your plasma displays. Did you know that Plasma screens can never be “re-charged”? Plasma display panels are composed of millions of Xenon gas pockets etched into a glass substrate. So called “ribs” within the glass substrate separate the pixels further, then the whole thing is sandwiched with another layer of glass, making “re-gassing” impossible. Did you know that plasma displays are prone to “burn in”? Plasma displays, like early CRT televisions, are prone to burn in. Burn in is an afterimage that has been “burned” into your plasma display. Burn in is permanent, and is not repairable. Prolonged display of static images, like network IDs, stock tickers, scores on video games, that sort of thing, contribute to this effect. As a result, most major plasma display manufacturers, like Pioneer and NEC, build in a variety of features to reduce the possibility and severity of burn in. These features include orbiters, which will “wave” the picture slightly, screen wipers, which wipe a white bar across the screen when activated, the white flash utility, where the screen will flash a 100 IRE white, “resetting” the pixels. As well, you can reduce the potential for burn in by never setting the picture so it’s over-bright. In addition, you can play a dynamic, moving image after prolonged display of static images (for example, watch a DVD after playing a video game.) The bottom line is this: treat your plasma like a fine automobile. Some manufacturers, like Panasonic, have claimed that their displays won’t burn. Be cautious - Treat it well, take care of it, and it will last for decades. Did you know that the world’s largest plasma is a Panasonic? 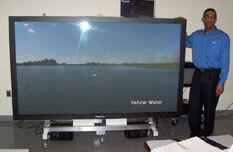 The world largest single screen plasma display panel is the Panasonic TH-103PF9UK. It has an active screen area of 89.3” by 50.3”, which translates to 31.19 square feet! It weighs 474 pounds and costs up to $70,000 before installation! The display boasts a resolution of 1920x1080P and a contrast ratio of 4000:1. The unit is so big it requires special modifications to your wall to hang it. Even getting the display to you can be a bit of a challenge, given the crate size is 8 feet 8 inches by 5 feet 8 inches by 2 feet 4 inches, and needs to be shipped on a flat bed truck. Do you know what makes a good home theater receiver? Sound quality. Amplitude is secondary to excellent sound reproduction, a low sound to noise ratio. Low-end home theater receivers can be very loud, but also can produce a noticeable hiss, or muddiness, in the soundscape. We recommend products like Pioneer, Panasonic, Denon, and Harman Kardon. Your home theater receiver is also the router for your home theater experience; it functions as a video switcher as well as an audio processor. To this end, there are two very important features that your home theater should have to maximize performance with a digital monitor, like a LCD or plasma. 1) Progressive scan DVD player. The player doubles the picture information encoded on the disc, improving image quality for progressive scan displays, like plasmas, projectors, and LCDs. This feature eliminates most image artifacting, like ghosting and smear, because the display is receiving 60 full frames per second, instead of 60 half frames, or fields. Your eyes and brain don’t have to work as hard to perceive the image as one contiguous whole. 2)Component video switching. This means is that you can switch to and from a HD/component video source on your receiver. For you to access the benefits of progressive scan within a home theater system, you have to use a high definition connection, like a component connection. 3) HDMI video switching. This enables the receiver to switch between component or other HDMI sources. Some manufacturers, like Onkyo, include Scalers, circuitry which up converts NTSC video to a progressive scan or HD image. This drastically improves picture quality of low end video, and having this feature built in to your receiver means one less box in your home theater. Do you know the difference between LCD and plasma displays? LCD and Plasma displays may look the same, but they work very differently. LCDs use layers of a thin film containing the liquid crystal, while plasmas are composed of hundreds of thousand of glass bubbles, powered by millions of transistors. Both technologies have benefits and drawbacks. The chief advantages of plasma are that I) they are brighter, meaning that there is less competition with ambient light, ii) they have better viewing angles than LCDs; LCDs look better the closer you are to a center line from the screen, and iii) plasmas aren’t subject to “lag” manifesting as a distortion of fast moving on screen objects, also known as “artifacting”. LCD displays are always a little behind the action, and can “smudge” fast moving parts of your image, like footballs, running backs, rain drops, or any fast moving on-screen object. LCDs and plasma screens currently last anywhere from 60,000 to 100,000 hours. Do you know why power conditioners and surge suppressors are important? Electrical equipment operates on a series of times pulses, or frequency. Synching and smoothing these timed pulses is very important for maximum picture quality. The trick is to get all of your devices working at the exact same cycle, so all the pulses of electricity happen at the same point in all devices at the same time. This reduces image distortion and can drastically improve picture quality. Power conditioners do more than just get your imaging devices working at the same frequency; they massage and stabilize the power supply, optimizing it for use in your high end home theater. Surge suppressors stabilize and limit current fluctuations. An extreme example is having your local transformer hit by lightning. A surge suppressor will protect your home theater investment by stopping that jolt of electricity before it gets to your home theater, preventing damage. 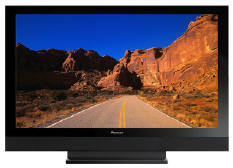 Do you know who invented the plasma monitor? The first plasma display was invented by professors Donald Bitzer, Gene Slottow, and then graduate student Robert Willson at the University if Illinois in 1963. In 2002, they received an Emmy for technical innovation. The first plasma display was only a few pixels large, and was entriely orange. Now plasmas can have over a million pixels, and over one billion colours. Now that’s progress! Do you know who makes your plasma? There are only a handful of manufacturers that actually make plasma displays. Many lower cost units, like Sampo, Gateway, and Akai, are Korean or Chinese knock-offs of Japanese units. As a result, they tend not to perform like their higher quality Japanese cousins. NEC is currently the largest manufacturer of plasma displays in the world. Their “chassis” (panel and electronics) can be found in Sony, Runco, and Marantz PDPs, among others. LG / Zenith, Panasonic and Pioneer all make their own displays, while Philips, JVC, and Sharp, buy chassis from manufacturers like NEC and Panasonic. Hitachi and Fujitsu make most of their own models (they share manufacturing facilities), and buy what they don’t build themselves from Pioneer or Panasonic. Do you know which is the best display type for your home? There are several competing technologies fighting for a spot in your home. One of them, projection television, has been around for some time, while LCD and plasma displays are relative newcomers. Modern projection TV is generally found in two types, LCD and DLP. Both are much stronger than the older CRT units you’ve probably seen, but projection TV is still prone to some inherent weaknesses. The picture will dim, or flatten out, as you get farther off center from the screen. Projection TV is also not anywhere near as bright as a plasma display, and the color is not as vibrant. Projection TV is also much larger than a plasma or LCD. As a result, they tend to cost less for similar resolution. Assuming there is room in your budget, plasma displays are by far the best choice, currently, for use in your home.